Prized by Indian, Scandinavian, and Middle Eastern cooks, cardamom has a sweet, warm taste and an exotic floral aroma. Its uses span the culinary spectrum--from beverages and delicate desserts to meats and curries. Cardamom is available in the pod, or with the pod removed. 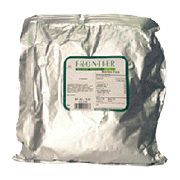 Frontier offers the best all-natural and organic whole cardamom pods powdered and whole, in a variety of packaging options to suit your individual needs. Fresh cardamom pods are green. Careful drying retains the green color of the pod and the flavor of the cardamom seed inside the pod. Cardamom seed stored this way has the highest essential oil content and therefore the most flavor. Cardamom Pods Whole Green Extra Fancy Grade is shipped in a discrete, unmarked package. Orders are processed immediately and usually take about 3 to 5 working days to be received. We do ask that you try it for 2 to 3 weeks to feel the full effects. Any information received is used only for order processing and shipping purposes. Your information, such as e-mail address, will never be disclosed to a third party.